Despite the increase in adoption of SSDs in the industrial computer sector, price remains a major concern. Apacer seeks to address this issue with a quality SSD product. Apacer, one of the world's top ten PC SSD suppliers, has introduced a large-capacity MLC wide-temp SSD with CF and SD interfaces designed for industrial computer systems and automatic applications. Favorably priced, the product employs the vendor guaranteed flash chip, which means it can run stably under industry-level extended-temperature (-40°C ~ 85°C) environments. It stays reliable even at very high or very low temperatures, which makes the SSD a great storage solution suitable for the military, aviation, automobile, oil-well drilling and other industries. Apacer’s next-gen MLC wide-temp SSD includes an CF card compliant form-factor with CFA 4.1 specifications and an SD card supporting the SDHC Class 10 standard. The CF card adopts the standard 50-pin connector; the data transfer mode is up to PIO-6, Multi-Word DMA-4 and Ultra DMA-5, available in capacities from 8GB to 32GB. It features sequential read/write speed of up to 55/20 MB/Sec, which is about 3 times faster than that of its predecessor. The industrial SD card version supports the ver. 2.0 standard as defined by the SD Association, available in capacities from 4GB to 32GB. It also effectively enhances file transmission speeds thanks to sequential read/write speeds of up to 19/14 MB/sec. Above all, this series of products adopts vendor guaranteed wide-temp MLC chips for the highest reliability and longest lifespan, while the firmware and major components of Apacer industrial SSDs can be tailored to customer’s specifications and verification, which reduces the risk of out-of-stock and compatibility issues by offering a stable supply. To give a performance boost, this product series comes equipped with an industry-leading Error Correcting Code (ECC) function, S.M.A.R.T technology, and the ATA Secure Erase command, all of which enhance the product’s reliability and stability. Apacer believes that the MLC chip will initiate a new market direction and expects a significant rise in demand, thanks to the newly incorporated wide-temp support, compared to the existing advantages of the SLC chips in terms of a huge capacity and low production cost. 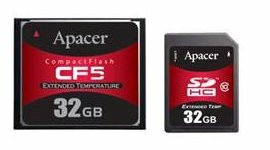 Samples of Apacer’s CompactFlash5 and industrial SD-M are now available for the customers to run tests on. Please contact your local Apacer sales representative.